This week I attended a Gift Aid training session hosted by Cybertill, to see how charities can maximise their Gift Aid capture. I used to hate it when at the end of a training session you’d be asked, ‘so what have you learned?’ ugh. Thankfully Sue who delivered the training didn’t ask this, she didn’t need to because as we went through each section of the agenda, we did a little recap and ticked it off, helping everyone to remember the topics that were covered. Perfect! One of the main things I did take away from the session was about promoting and asking for Gift Aid. Sue summed it up brilliantly when she said, “don’t just walk up to someone and say, ‘are you a UK taxpayer?’ it’s very harsh.” She’s right. Imagine being accosted in a shop by someone asking if you pay tax – you’d run for the door! When asked about promoting Gift Aid, feedback from the charities who attended were mostly the same – word of mouth and having a small sign in the shop. Don’t get me wrong, having a sign is good, don’t remove it, but there’s more to promotion than a nice poster and occasionally asking someone to Gift Aid. We all know how important Gift Aid is to charities, it’s a great way to get an extra 25% relief from HMRC, which all goes towards making more money for a good cause. But what happens when you have it set up, but your supporters and donors don’t know anything about it? Social media is a great free tool that charities can use to promote their shops, but why not use it to promote Gift Aid too? If you don’t have any social media accounts, set some up, using popular charity and local hashtags to get your message to as many people as possible. 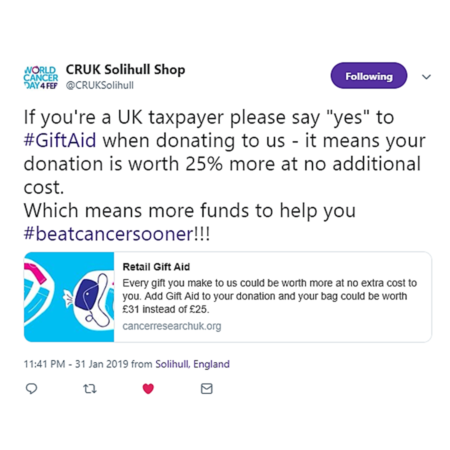 Take a look at what the Cancer Research UK Solihull shop are doing on Twitter, they’re really making the most of the tools available to not only promote their shop, but getting the Gift Aid message across, adding a link to the page on the website that goes into more detail on what Gift Aid is and how donors can help. If you’re a smaller charity and don’t have much experience with social media, you should read Cybertill’s guide to using social media for charities. Or get your volunteers involved, chances are there is someone within your shops who can use social media to help you get your message out there. It’s important that you keep your messaging in-store but make it big and put it by the counter, or where donations are usually dropped off. The Headway charity shop on the high street in Cheadle have a big hanging sign in the shop and a poster outside on the pavement letting passers-by know they can volunteer, donate and Gift Aid. Perfect for reminding donors or persuading them to ask in-store about Gift Aid and how they can do it. Another great in-store promotion is to add a Gift Aid message to the bottom of your till receipts, it only takes a minute to do and means you can let all of your shoppers know that if they decide to donate, they can also help you increase revenue. This is a great way to increase loyalty amongst your donors and make sure you maximise Gift Aid revenue. 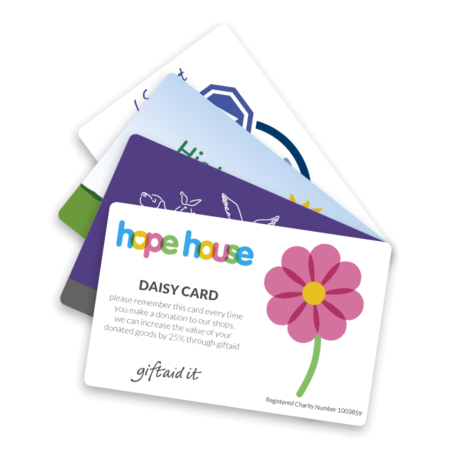 Once a donor has agreed to Gift Aid, hand them a donor card that has their unique donor ID on it and design the card to include some stats about how much more your charity can make when people agree. Plus, donor cards mean that when a donor comes back, they don’t have to hand over their details again. All they need to do is hand over their card to staff or a volunteer to be scanned, the bag labels or slips are printed straight away so you can attach them to the bags, know whose donated what and not miss out on Gift Aid. It’s as simple as that. Sounds simple really, but it’s essential that you train your staff and volunteers on Gift Aid. You don’t need to go into too much detail, just let them know the basics and give them ideas on how they can ask donors if they are interested. This is crucial with your volunteers, sometimes they may not want to ask the question, they may feel its intrusive or won’t ask because they don’t understand it. Rather than ask donors straight out if they’re a tax payer, ask them if they know that they can help the charity make an extra 25% on donated goods. Engaging in conversation and providing donors with a quick overview of how they can help is a surefire way to gain that extra revenue. Make sure you’re shouting about Gift Aid! Find out more about how your charity can increase Gift Aid by at least 20-40%* by downloading the CharityStore platform brochure here. *Based on Cybertill’s ROI calculator for Gift Aid capture. We also propose that at the end of year one of implementing the CharityStore platform, charities have seen increases of at least 40% and the average transaction value increases by at least 20p.